Usually I only see Yellow-bellied Sapsuckers in the shade as they make their way quickly around the trees, but this male stayed out in the sunshine eating persimmons, long enough for me to get a few pictures. They’re blurrier than I would like, but they show the red feathers on crown and chin well. 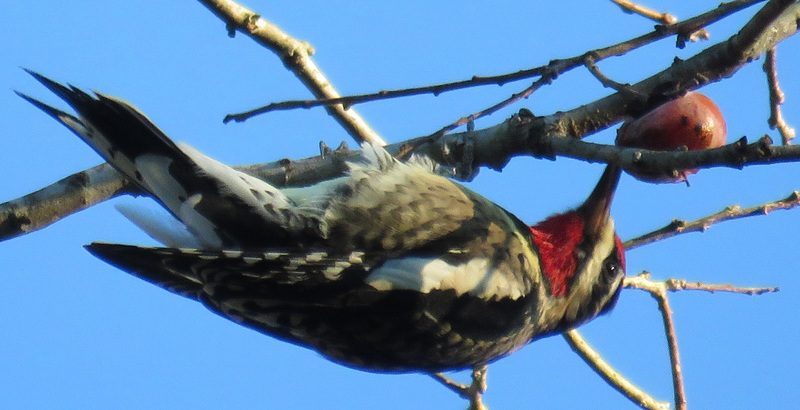 The sapsucker is a woodpecker that has strayed from the paths of virtue; he has fallen into temptation by the wayside, and instead of drilling a hole for the sake of the grub at the end of it, he drills for drink. He is a tippler, and sap is his beverage; and he is also fond of the soft, inner bark. He often drills his holes in regular rows and thus girdles a limb or a tree, and for this is pronounced a rascal by men who have themselves ruthlessly cut from our land millions of tress that should now be standing. It is amusing to see a sapsucker take his tipple, unless his saloon happens to be one of our prized young trees. He uses his bill as a pick and makes the chips fly as he taps the tree, then he goes away and taps another tree. After a time he comes back and holding his beak close to the hole for a long time seems to be sucking up the sap; he then throws back his head and “swigs” it down with every sign of delicious enjoyment…However, the sapsucker does not live solely on sap; he also feeds upon insects whenever he can find them. …The sapsuckers spend the winter in the southern states where they drill wells in white oak and other trees. From Virginia to northern New York and New England, where they breed, they are seen only during migration, which occurs in April; then the birds appear two and three together and are very bold in attacking shade trees, especially the white birch. 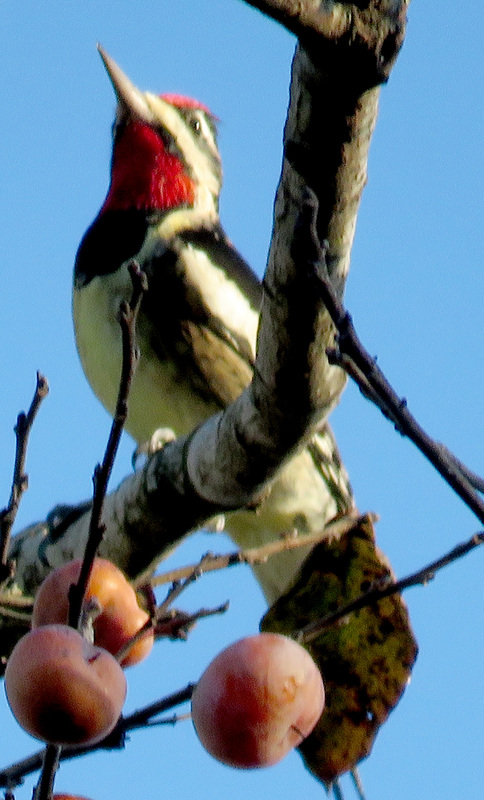 Leading Thought — The sapsucker has a red cap, a red bib, and a yellow breast; it is our only woodpecker that does injury to trees. We should learn to distinguish it from the downy and the hairy, as the latter are among the best bird friends of the trees. Now Mrs. Comstock first published these words in 1911– the copyright was renewed in 1939, and my version of the book was printed in 1957. It’s interesting to me that she viewed these birds as injuring trees and committing sins. I don’t have a science background, but I can figure out that as migratory woodpeckers, sapsuckers don’t have a lot of time to damage individual trees. I checked my ten other bird guides (I am not exaggerating), and none of them express any concern about sapsuckers damaging trees. One writer says, “A pair of sapsuckers might drill a number of sites within their forest territory. The wells fill with sweet, sticky sap that attracts insects; the sapsuckers then make their rounds, eating both the trapped bugs and the pooled sap…Species such as hummingbirds, kinglets, warblers, and waxwings also benefit from the wells made by Yellow-bellied Sapsuckers, especially when flying insects, fruit and nectar are rare.”* So these days we realize that they have their benefits. But while Comstock’s judging the “morality” of wild creatures seems dated, her image of the bird as a tippler will always stay with me, and help me remember and differentiate this species from others.